Delicious food finds, recipes and foodie gadgets! There’s something comforting about the flavour of apple pie. Sweet, tart and spicy all at once, it’s always a treat. That’s why I always keep a jar of apple butter in the house. It’s really like concentrated apple pie flavour in a jar that you can spread on just about anything whenever you get a pie craving. Best of all, the brand I buy – Wellesley – contains no added sugar or colouring so it’s a lot healthier than a slab of apple pie. But me being me, had to go and take this pretty healthy ingredient and pair it with something very unhealthy – cake. 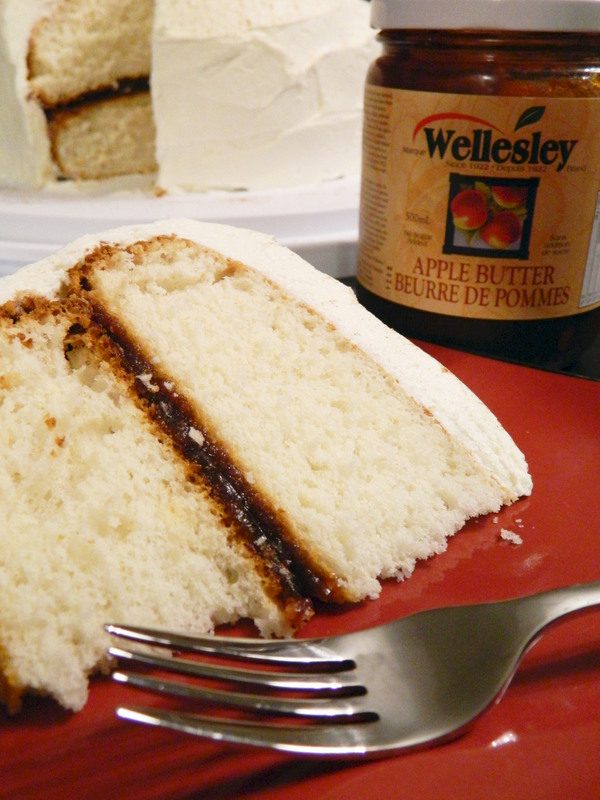 The result was a beautifully moist cake, with rich icing, offset by the spice and tartness of the apple butter filling. I bought it in to work and it quickly disappeared. Prepare one box vanilla cake mix (or spice cake!) as directed or doctor it up. (See directions for kicking up a cake mix here.) Pour into two 8″ round baking pans that are well greased and floured. Bake and set aside to cool. In a stand mixer, whip the butter for 2-3 minutes until it is almost white in colour. Add in the powdered sugar, vanilla and 3 tablespoons milk. Beat on low speed for 3-5 minutes, adding in the last tablespoon of milk if the buttercream needs to be thinner. To assemble the cake, place 1 of the cake rounds on your serving plate and spread 3/4 of a cup of apple butter in the center of the cake keeping it about 1 inch away from the edge. Top with the second cake round and place 2 – 3 bamboo skewers through both layers to keep it from shifting while icing the cake. Remove the skewers when the cake is fully iced. Sprinkle the top of the cake with 1/2 teaspoon of cinnamon. Enjoy with a big glass of milk.